Chris Doak says his "nightmare 2015" was complete after he had to concede defeat in his battle to retain his European Tour card for next year. 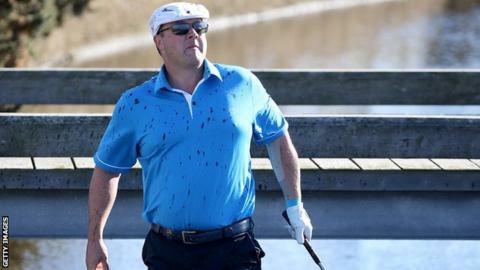 The 37-year-old Scot started the second stage of the European Tour Qualifying School despite suffering from a trapped nerve in his neck. But he was forced to retire midway through his second round in Valencia. "Time for rehab injections or surgery," he wrote on Twitter. "2015 you have been a nightmare." Despite his own disappointment, Doak took time to send a message of congratulations on social media to the Challenge Tour graduates who successfully gained their card for next year's main Tour. Scottish pair Andrew McArthur and Jamie McLeary were among 15 golfers to make it through after finishing 12th and 15th respectively in the standings. The 36-year-old McArthur finished joint 30th at the NBO Classic Challenge Tour Grand Final at Almouj Golf in Muscat, while McLeary, who is two years younger, made the list despite being 43rd in a 45-man field. However, compatriot Scott Henry missed out despite finishing in joint seventh place, four strokes behind tournament winner Ricardo Gouveia of Portugal, the 28-year-old ending the season 18th in the standings. Doak will join him on the Challenge Tour next year and rely on sponsors' invites to participate in tournaments on the main European Tour in 2016. He had started his latest tournament in Spain despite the nerve condition that has affected his grip for the past two months. After carding a first-round five-over-par 77, he was forced to retire midway through his second round at El Saler. It is the sixth time this year that Doak has had to retire or withdraw from a tournament prior to completion of his second round. Doak took the gamble of heading to Spain days after undergoing an MRI scan to determine the full extent of the ailment and receiving the results on the way to the airport. "It's a nerve that's pinching the route of my neck," he said. "I'll either have to undergo rehab, take a possible injection or possibly require surgery. "I'll try rehab first before considering the other options." The problem, which has left him with pins and needles in his left hand, means he swings only with 30% of his normal grip.